This post is based on my previous post Ionic 3 and Firebase authentication using AngularFire2. You can download the code on GitHub at https://github.com/henkie14/ionic3Firebase. Make sure you change the Firebase configuration in the app.module.ts file. In this post I will continue working on the project above and add native Facebook authentication to the Ionic app. The first thing you will have to do is to create a new Facebook App in the Facebook developer portal, install the cordova Facebook plugin and configure your Facebook app for Android and/or iOS. 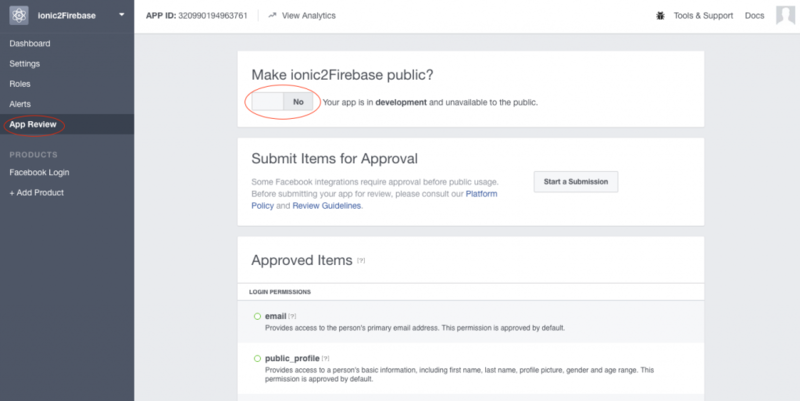 There is a nice installation guide on http://ionicframework.com/docs/v2/native/facebook/. Make sure you do the installation up to the Events chapter and you are good to go. For future use make sure you can find the Facebook App ID and App secret you will need them in a later stage. Eventually you should have an APP_ID, an APP_NAME and the App secret. Now you can run the following command. (Add –save if you want the plugin and configuration to be stored in your config.xml). And add the loginWithFacebook method to home.ts. There’s a lot going on here, let me explain. There’s an import of Platform, that’s being used to check on what platform the app is running, based on the platform we will call the native Facebook login or a pop-up. 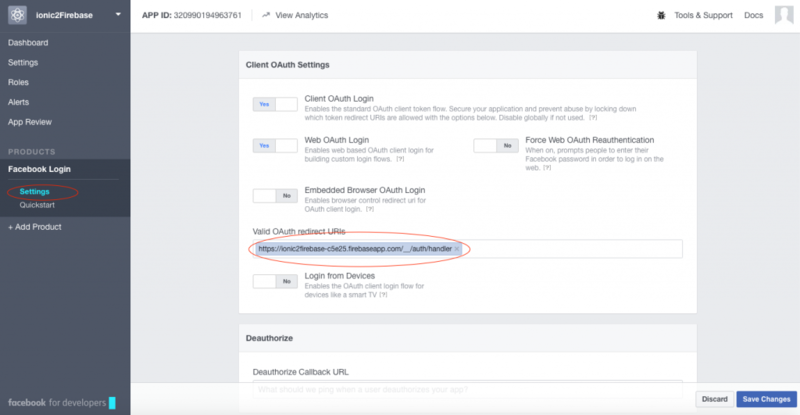 The Facebook import is used for calling the native Facebook plugin. Ok, let’s run the application to see if it’s working. First test it in your browser. The given sign-in provider is disabled for this Firebase project. Enable it in the Firebase console, under the sign-in method tab of the Auth section. So let’s go to the Firebase console again at https://console.firebase.google.com and select your project. Next select Authentication on the left hand side and click the tab ‘Sign in method’. Click Facebook and enable it. Fill in you App Id and App secret, if you didn’t already write them down you can get them from your Facebook developer portal on the dashboard page (https://developers.facebook.com). Make sure you copy the OAuth redirect URI and click the save button. Now you should go back to the Facebook developer portal and click ‘+ add product’ on the lef hand side and select ‘Facebook Login’. 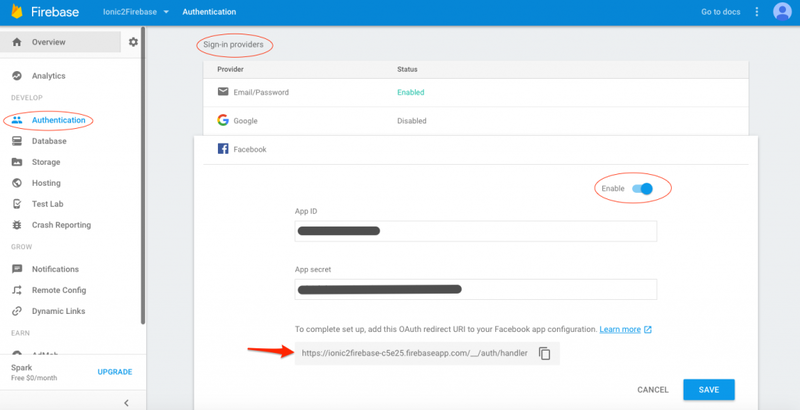 Next click ‘settings’ below Facebook Login on the left hand side and fill in the Auth redirect URI you’ve copied from the Firebase Facebook provider settings. Let’s test it again in your browser. When you click the Facebook login button you should see a popup where you can connect with your Facebook account and when you login, it should show the corresponding email address as the current user. You can also check the users tab on the authentication menu in the Firebase console to see all registered users and their provider. Now let’s try it on android to see if the native Facebook functionality is working. Connect you Android phone and run the following commands. This can be fixed by going to the Facebook developer portal again and after selecting your project, you should select ‘App Review’ from the menu on the left and make the app public. And configure it in your Facebook configuration.